Following heavy rain on runways, the surface can be grooved in order to minimize the risks of aquaplaning. Thanks to this technique, the surface water film flows into the grooves where the peaks between the grooves will still be in contact with the aircraft tyres. In order to maintain the macro and micro texture on the runway, the airport authorities have to carry out rubber removal operations on a regular basis. Without this macro and micro texture the friction level of the runway surface is too low and potentially extremely hazardous. For this reason Blastrac used its 2-45DTM truck mounted shot blaster to remove rubber on the grooved runway. The results were a great success for the airport authorities and measurement proved that the friction level increased after the machine was used on the runway. There was no steel shot left between the grooves and the surface was directly ready to be used again (no need to dry the surface, and in case of an emergency the Blastrac 2-45DTM can leave the runway within seconds). By shot blasting the grooved runway, you can get the friction level of the surface back to its original properties /condition or even better. This eliminates slippery surfaces in wet conditions and it improves the security for both aircrafts and passengers. 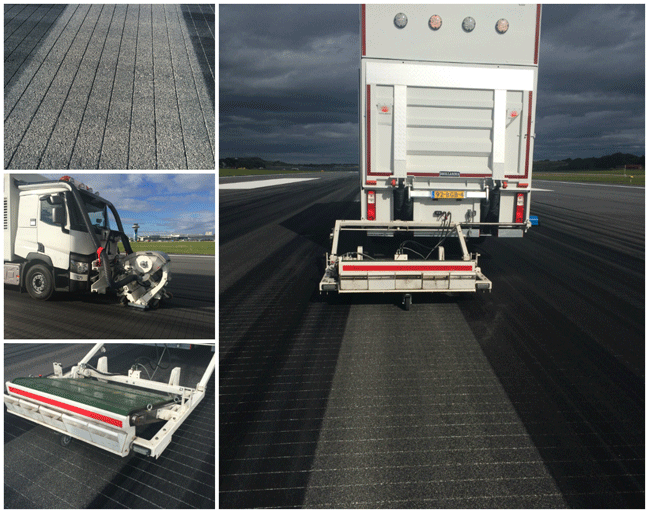 The Blastrac 2-45DTM is the most powerful and most cost effective solution to remove rubber on runways. Because of its high performance and reliability, it is possible to treat a surface up to 3000 m2 per hour on runways. Below you can see some pictures of the demonstration. Blastrac is proud to announce that after this successful demonstration the customer has immediately purchased the machine as they saw the potential for the 2-45DTM for both highway and airport applications.